I am delighted to have been part of the First Furlong Event for the past 5 years. This event gives me the opportunity to showcase my Millinery designs at a special event where each of us Galway Millinery can highlight our unique hats. 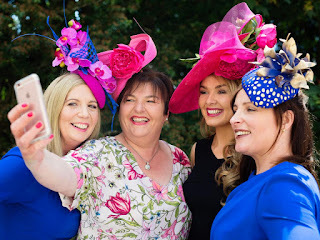 It is no secret that Galway is the capital of Millinery and at First Furlong you will see ample evidence of this with every lady wearing a hat on the day in a bid to secure the 'Raciest Lady' prize!! 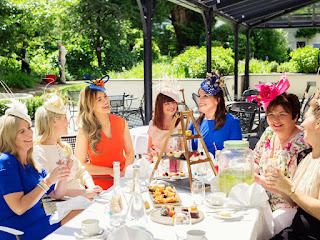 The launch was in the beautiful gardens of the Ardilaun Hotel in glorious sunshine. My continued support of the Breast Cancer Research is also a very important to me. As one of my chosen charities to support through my work as a Milliner. Lynn from Anthony Ryans, Caitlin Catwalk Modelling Agency and Jennifer Skeffington each wearing one of my bespoke millinery designs for the launch. Setting the scene for our photographer on the day Wonderful Life Productions. First Furlong at the Ardilaun Hotel takes place on Tuesday 1 August and encapsulates all the fun of the Galway Races with lunch, music and fashion. MC this year is well-known fashion and lifestyle blogger, Lisa McGowan from Lisa’s Lust List. Starting at 12 noon with a sparkling drinks reception those attending will enjoy a four course lunch with wine, followed by an afternoon of fashion with a Millinery Showcase hosted by Mandy Maher of Catwalk Modelling Agency featuring some of Ireland’s leading Milliners; Suzie Mahony, Caithriona King, Majella Dalton with fashion by Anthony Ryans. The perfect opportunity to chose your crowning glory for the Galway Races. Lisa McGowan from Lisa’s Lust List will also judge the ‘Raciest Lady’ and ‘Bookies Favourite Gent’ sponsored by Anthony Ryans. Entertainment will be by the Guinness Jazz Band, and a special performance by classical tenors Duo Vocis featuring Frank Naughton and Sean Costello. Tipsters will be on hand to give racing tips before everyone is shuttled to Ballybrit for an evening of racing. Tickets are on sale from the Ardilaun Hotel for the price of just €75 all in, including shuttle and entry to the race course. All proceeds will go to Galway based charity Breast Cancer Research who fund a research programme at the Lambe Institute for Translational Research, NUI Galway led by Professor Michael Kerin. Professor Michael Kerin and Jennifer Skeffington BCRI wearing Suzie Mahony Designs. The scene was set for the first Pre Races Fashion Event at the Oranmore Lodge Hotel on a glorious Sunday afternoon. With lots of bubbly, racing fashion and millinery it was the place to be to get your race style tips for The Galway Races. Ladies day at the Galway Races is the largest ladies day in Ireland so we need to plan in good time for our outfits and hats!!. The event was in aid of Oranmore Maree Coastal Search Unit. Special guest for the afternoon of fashion, hats and fun was Faith Amond. I've known Faith for a number of years, designing hats for her and she always looks effortlessly elegant at any race meeting. I was delighted when Faith scooped the prestigious best dressed prize at Aintree last month walking away with a stunning Land Rover!! Such a fashion event wouldn't be complete without Mandy Maher Catwalk Modelling Agency /TV3 Stylist who was our MC for the day. Here she is looking radiant in royal blue from Olivia Danielle Athlone. This year I am busy designing hats for Ascot and already processing orders for the Galway Races which is great. Designing the correct angle, shape and look for a client is key to the overall look. I love creating new designs and styling your complete look at my Suzie Mahony Designs studio. All our models for the day are from Catwalk Modelling Agency, Fashion below from Olivia Danielle with hats from Suzie Mahony Designs. Jumpsuits are now added to the 'allowed list' at Ascot this year for the first time. They are so comfortable and can look very classy. This pale blue and ivory lace jumpsuit below is teamed with Suzie Mahony Designs ivory hat trimmed with pearls and beading. A very simple elegant look. I love the little sleeve as well. The dress and coat combo will never go out of fashion. This red print stands out and with a block colour red hat or headpiece you can't go wrong. Focusing on neutral tones, a dress and coat outfit teamed with ivory headpiece but it is embellished with metallic silks and beading. Every lady should have a black and white look in her wardrobe. If your heading to the races this suit is perfect. Beautiful texture. Pop a black and white hat with it to bring out the detail in the suit or even go all out with a striking black piece. Either would look fab here. I love this colour, rich turquoise but with just enough pink in my hat design to give the whole look a beautiful finish Again lovely textures in the quality clothing and the hat shape works well here giving the whole look a real classy edge. I hope you picked up some ideas or tips for your racing outfit! !